No, I'm Not Talking to Myself: I should probably stop naming the creepy crawlies. I should probably stop naming the creepy crawlies. For a few days after the apartment complex sends the pest control guy around, the bug population is a little stirred up. They pop up everywhere. Just in time for Halloween. Yay. On a related note, I have a new roommate. Zoomed in as much as possible from as far away as possible. So much for my future career in nature photography. 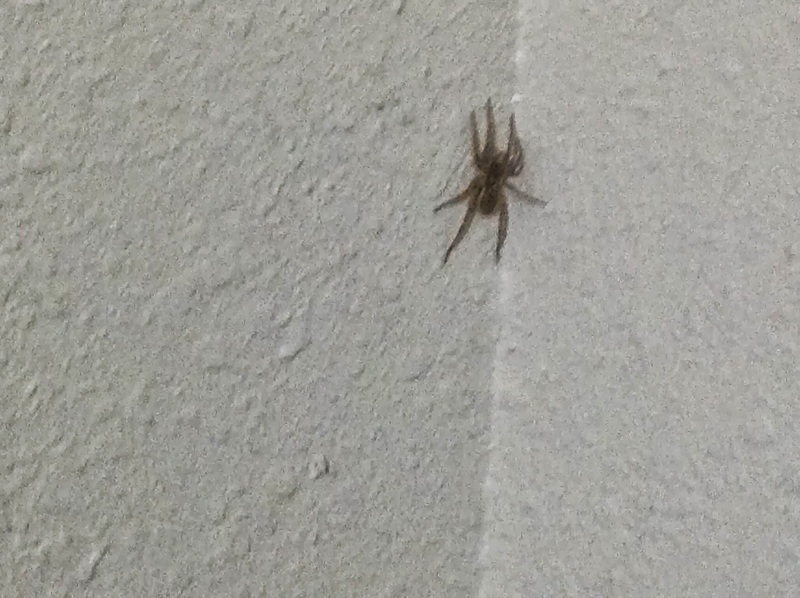 Since my new roommate has eight legs, and because he is at least spider number five to pop up in the last couple of days, and because it's football season and because he's really annoying, I have decided to name him Chad OchoCinco. Roommate update: Prior to publication of this post, Chad OchoCinco (the spider) met an untimely, though very satisfying death via leather footwear. Because really, who hasn't wanted to smack Chad OchoCinco (the athlete) with a shoe?